Clear your calendar for September 17-19, 2014 and join hundreds of Cloud users, accounting professionals, CPAs and business owners to maximize your Cloud investment. Co-hosted by the BMRG Advisory Group and Cloud9 Real Time, this cloud computing event will answer the questions you have (and the ones you haven’t thought of) about virtual financial and business management, preparing you for major growth and change. THE Cloud Computing Event Not To Miss! Cloud Summit ’14 combines keynote talks by some of the most influential thought leaders and tech experts in the industry — including Orvel Ray Wilson, Doug Sleeter and Greg LaFollette — with hands-on workshops, 1-on-1 training, educational and marketing sessions and time for networking with other professionals in every stage of implementation. CPE credit will be available, as will introductions to best-of-breed cloud-based accounting solutions. Get hands on training for YOUR cloud solutions, and tour the data center that houses your private virtual server! Registration is NOW open – reserve your spot today as space is limited and the Early Bird special that saves you $100 per attendee expires 6/30. Cloud Summit 2014 is THE exclusive 5th annual cloud computing event conference for professional practices and small businesses offering CPE credits, an all-star lineup of cloud implementation educators and one-on-one user trainings for the top-rated cloud computing solutions. 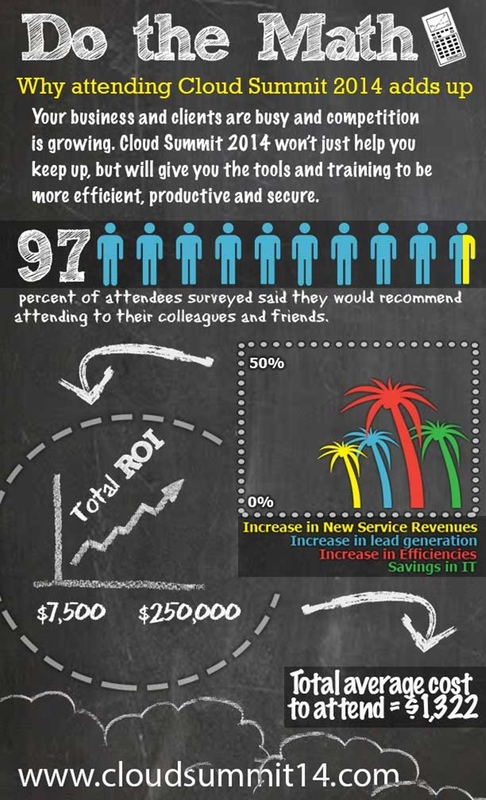 By attending Cloud Summit ’14, you’ll go beyond just “keeping up” with your professional peers. You’ll see a considerable ROI, have the opportunity to immerse yourself in the theory and practice of cloud-based accounting, and move forward with confidence as you learn better, more efficient and productive ways to manage your firm.